I just love a nice full midi skirt. Paired with a simple tee it’s one of my favorite silhouettes. 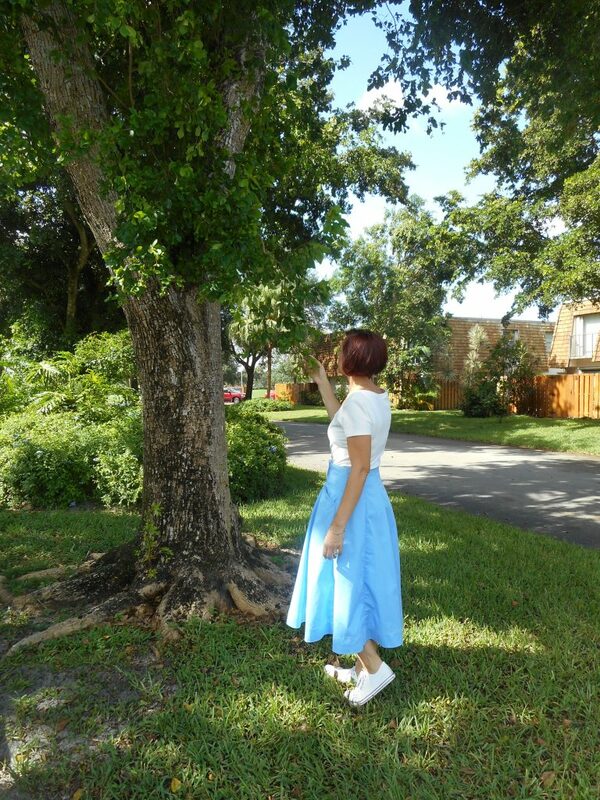 This Ice Blue Twill Burda Midi skirt paired with a self drafted white scoop neck tee is one of my new favorite outfits. The skirt is just casual enough for everyday wear, especially with the rustic coconut shell buttons, and the tee is a true wardrobe staple. This is my second go at this Burda skirt pattern. Last time I made it my fabric choice was a fail. Just too lightweight to support the silhouette. 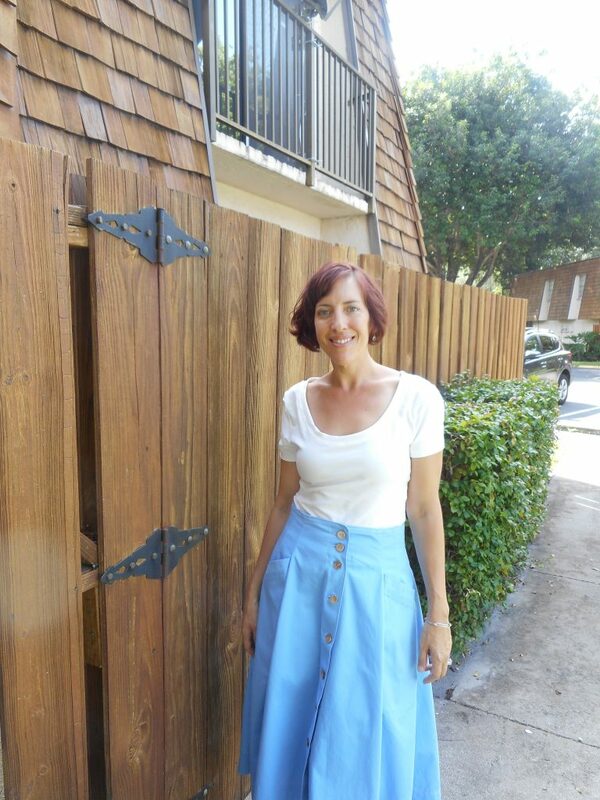 I’ve been planning to make this Burda Skirt again in a sturdier fabric for some time. When Organic Cotton Plus contacted me for another review of their fabrics I knew just what I wanted to make! I’ve been really wanting to try out their twills- I love them for pants and they have an awesome selection of colors (warm + cool colors). It’s a given that I’ll be ordering more in the future. I originally planned to make this skirt in an Orange/Rust color but after thinking it over decided to go for a more summery color. I already have a pair of twill culottes in that color. This is also one of my #2018MakeNine projects for the year. So far two done and one half way there! The Ice Blue Twill just makes me think of spring. So fresh and pretty. The twill itself has a nice sturdy hand and is a real workhouse fabric. It has a really lovely and pronounced twill pattern which makes for a nice bit of texture in this solid. I love wearing blue and white- as you can tell if you’re been reading my blog for awhile! So it was a no brainer to mix this skirt with a white tee. Width: 60 inches Weight: 7 oz./sq. yd. Content: Control Union (SKAL) 100% GOTS-certified organic cotton. Made in India. OEKO-TEX standard 100 Certified Eco Friendly and Sustainable. Pre-shrunk to 3-5%. Great for upholstery, slacks, pants, and jackets. Width: 56 inches Weight: 12 oz / linear Content: 90% organic cotton 10% spandex. Made in the USA. It’s wonderfully comfortable and absolutely perfect for all sorts of clothing. Colored using low-impact fiber-reactive dyes. Eco dyed, GOTS certified. 100% organic cotton. Multi-purpose 29/2, Tex 27 Sold by 300-yard spool. Made in Holland. The coating on this thread is a mix of special paraffines and silicones, all declared and approved according GOTS standards. Round, 2 hole, Made of coconut shell with a smooth, dark brown finish. I received the above fabrics and notions for this project in exchange for review and publishing on their blog, La Organica. 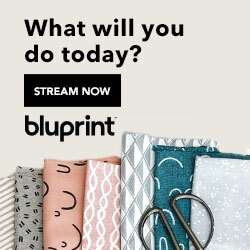 They’re my go to shop for organic and sustainable fabrics, notions, yarn and dyes. 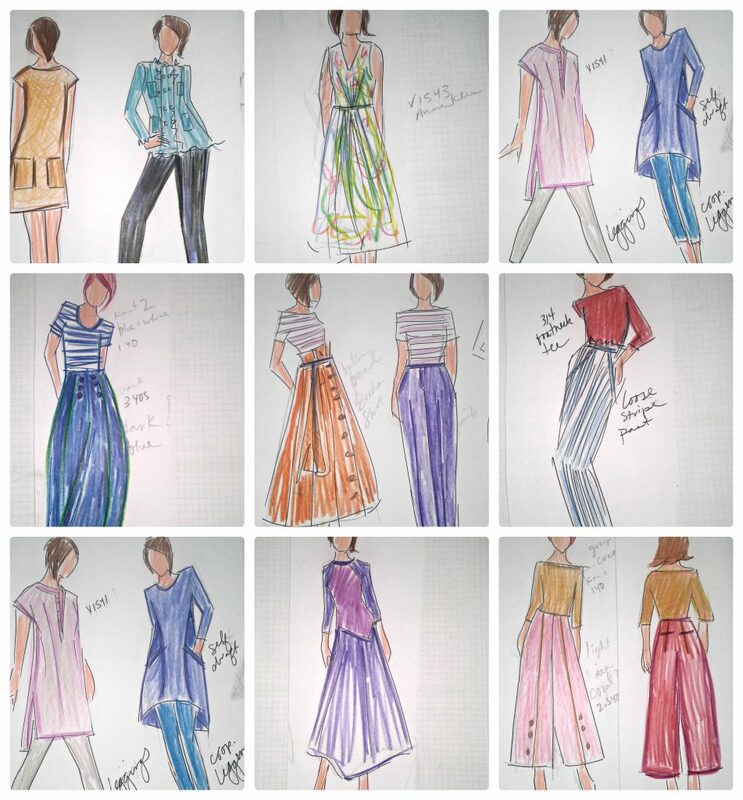 All the fabrics above come in multiple colors and are wonderful wardrobe staples. 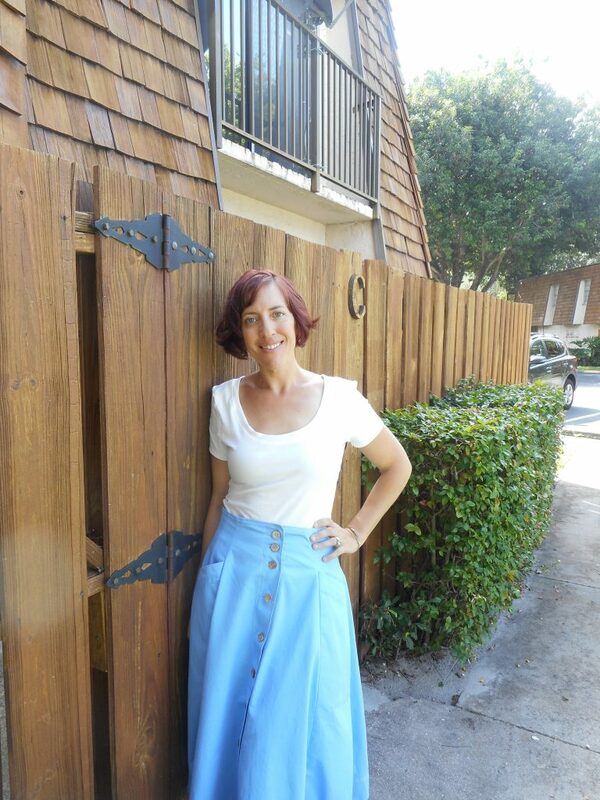 Flared skirt sewing pattern has big pockets, princess seams and buttons down the front. It sits high in the waist and gives a wonderful retro feeling. This pattern is from the Brazilian Summer collection. 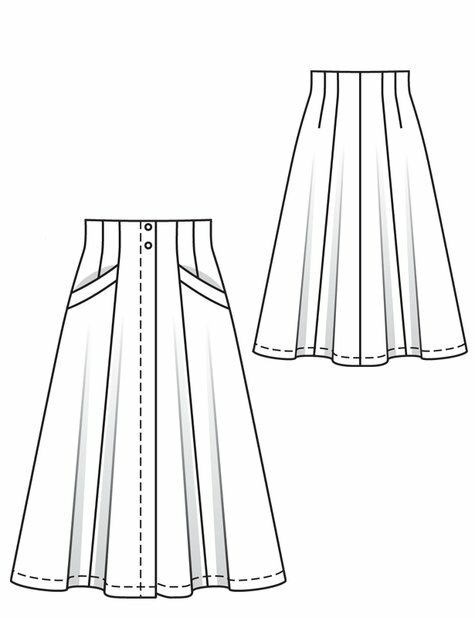 Recommended Materials: Skirt fabrics with some body, with or without elastane. Amount of Fabrics: Linen, width: 150 cm (59 ins) length: 2.30 m (2 5/8 yds) for all sizes. Vilene/Pellon G 785. 6 flat inside buttons. 2 hammer-on snap fasteners. This pattern doesn’t include seam allowance. Now lets talk construction. 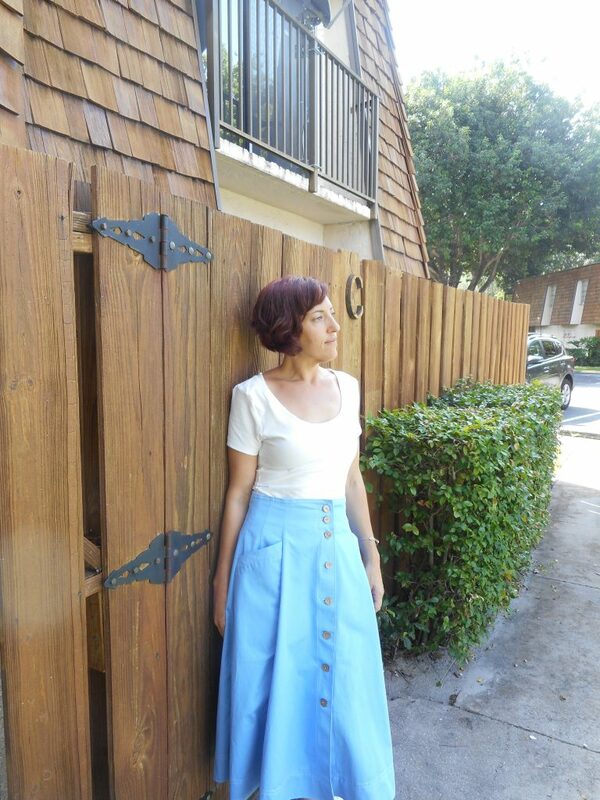 The shape of this midi skirt with its flared panels and high waist is just beautiful. Lots of waist shaping in the multiple darts and easy to assemble welt pockets make for a great design. 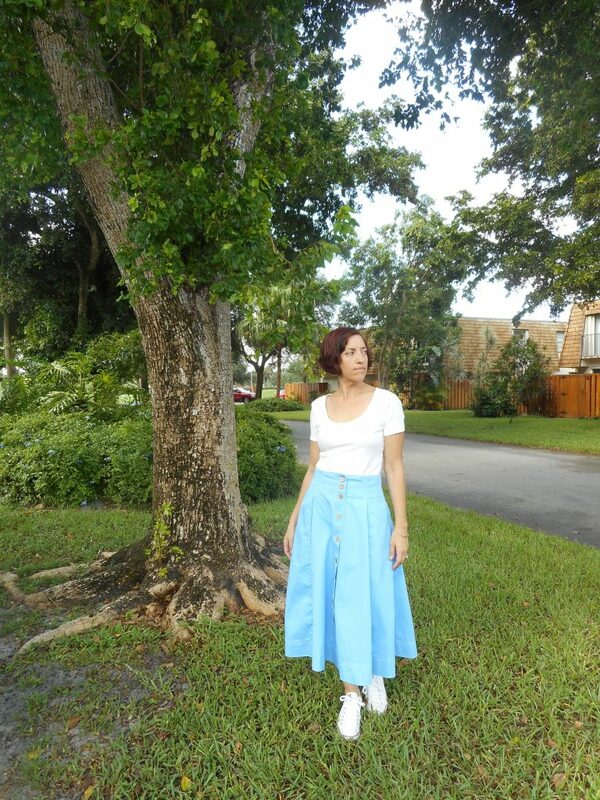 This skirt was made in a size 40 which is my typical size in Burda. I really love this make in the heavier weight of fabric. It still has a nice drape but is much more practical and I’m sure will be worn for a long time. 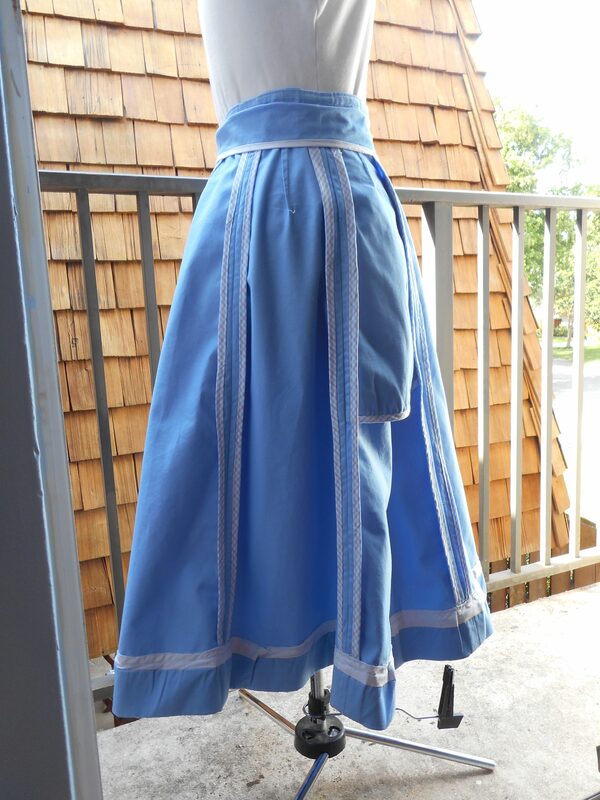 I made very few variations after making the first version of this skirt which you can view here. Because I had made this already I knew the fit was spot on. Burda tends to fit my proportions very well. After washing and pressing my fabric I pinned all my pattern pieces to my fabric and then chalked in my seam allowances before cutting. I find this more efficient then adding it to the pieces themselves- as I can change them to my preferred SA. 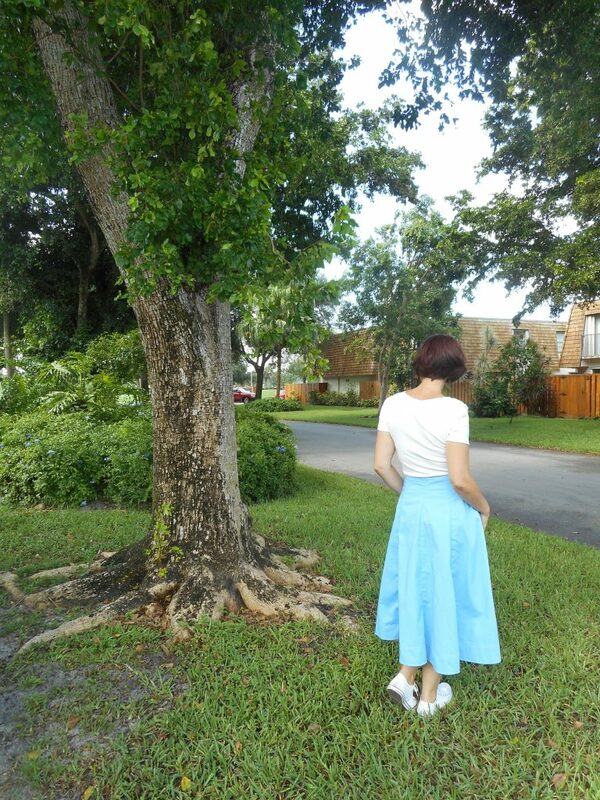 The skirt was finished with a 2″ hem. The button areas on the selvedge edge (my fav way to do plackets and keep a nice clean edge) with added width instead of using facings and omitted stabilizer as my fabric is very sturdy. I also enlarged the pockets quite a bit. I really prefer to have oversized pockets in a skirt. That way I don’t need to carry a purse. The skirt easily fit keys, phone and wallet in these with no problem. And because they are deep it keeps the silhouette even with full pockets. One of my goals with this make was a beautiful interior finish, so I used a Hong Kong finish on all the interior seams and the pockets. I made up a ton of bias for this make! 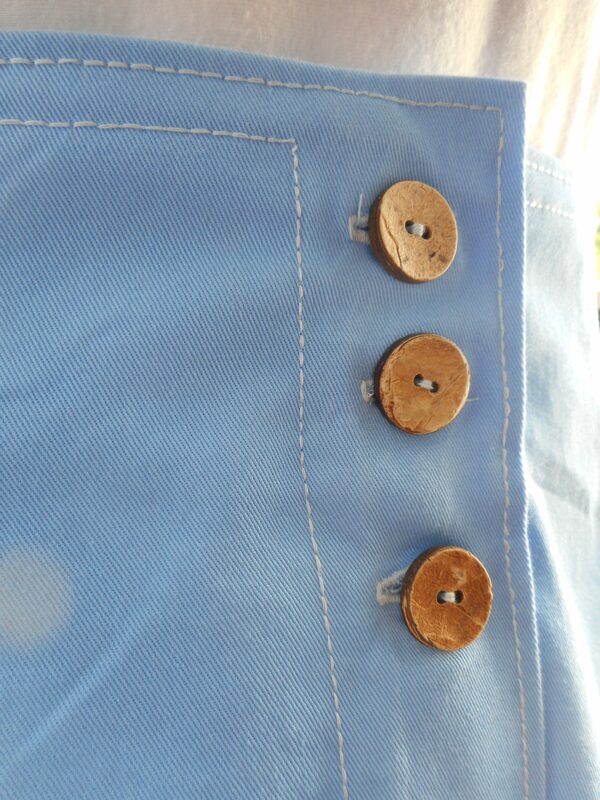 Luckily I had a perfect match to the ice blue in my repurposing stash- using my husbands old dress shirts. Time consuming- but I love seeing them when I put it on. 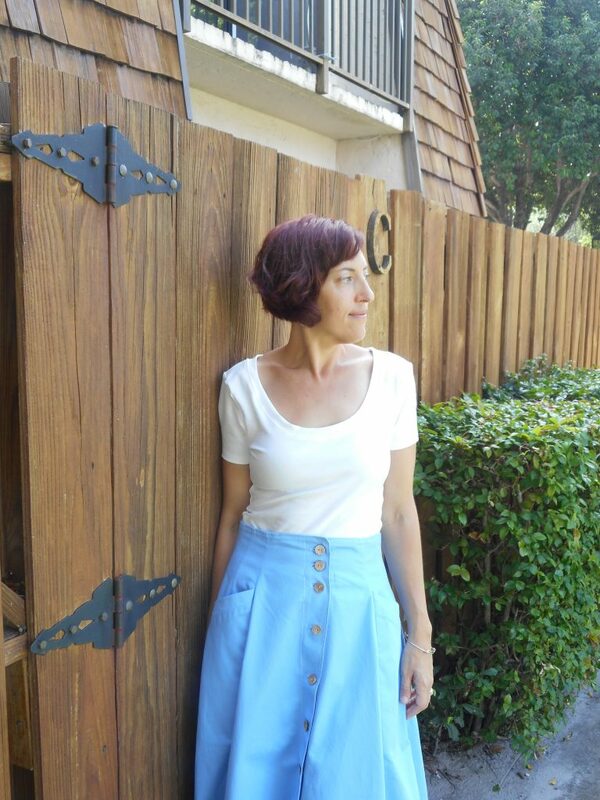 The skirt pattern calls for two snaps at the waist and a hidden placket of buttons underneath but I kept mine all on the outside since I do love a button front skirt. Luckily my machine cooperated with some good buttonholes. Plus how beautiful are these coconut buttons! They’re all ever so slightly different but add a nice rustic touch. I love the color and so far they are nice and sturdy. 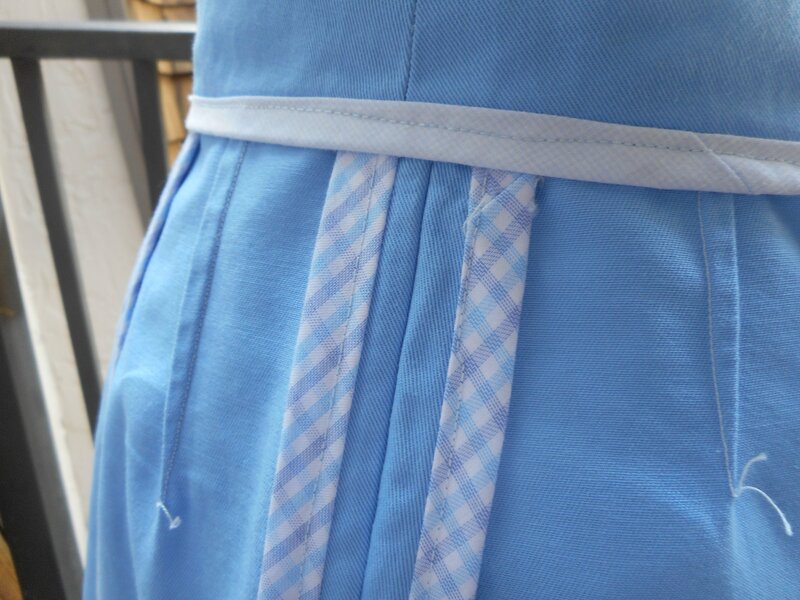 The hem was then pressed and handsewn before I did all the topstitching. I really like the effect of the slightly lighter ice blue thread on the twill. It adds a bit more dimension. Everything was topstitched with a double spool of thread to make it a bit more defined like I do on denim. Also worth noting, even though this is a heavier weight of twill it was super easy to stitch, even through multiple layers. Now on to the easy make- the scoop neck tee. I really love to wear a deep scoop on my tees. It really makes the most of my smaller bust and highlights my neck. This stretch jersey is wonderful to work with, it’s got a nice beefy weight to it and is perfectly opaque. What really makes it wonderful though is that 10% spandex content. Great stretch makes for a fab fitted tee. The stretch jersey in white was in production when I ordered but totally worth the wait. It was shipped quite quickly once in stock. This was self drafted off my knit bodice and sleeve slopers. Let me tell you, it’s so much easier to make what I want now that I have a large assortment of slopers. Everything fits perfectly and comes together quickly. I went with a short cap sleeve with a 1/2″ hem and sketched in the shape I wanted at the neck and then used a wide band to highlight it. Construction wise this was put together on my serger and coverstitch machine. I sewed one shoulder and then attached the knit band before sewing the second shoulder, next I attached the sleeves and then sewed up the sleeve and side seams in one pass. Easy peasy. I’m so thrilled with how this project turned out! It fits perfectly and I feel so pretty in this. Happy Sewing! Thanks so much Peggy! My guess is that it’s just easier/faster to leave off the seam allowance. 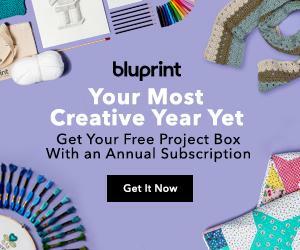 Especially given the quantity of patterns they release. Lovely skirt! Especially the waist! Thanks Susan! I do love a high waist!